Is it a bad thing being stuck with Rumo? I have only heard good things about their pits, and for us in Sweden they go for a affordable price. Maybe you know something i dont? Practically Rumo should be very simliar to the Horizon pits because of the original Oklahoma Joe connection. Horizon are the same people that first started Oklahoma Joe and gave the license to Rumo before selling Oklahoma Joe to Char Broil. 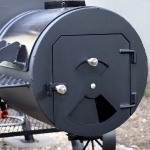 PS Have you checked out the pits over at http://texasbbq.se? And sorry, i wasn't allowed to respond to your PM. I dont think im trusted yet Could i contact you in some other form? slamkeys wrote: That pit looks very similar to the Horizon 20" RD Marshal. Nice big wagon wheels. Looking forward to hearing how it works when you get it. Yes, will do that . And i do think they are very similar, not just by the looks but also by the oklahoma joe connection i mentioned above. antinho wrote: And sorry, i wasn't allowed to respond to your PM. I dont think im trusted yet Could i contact you in some other form? txsmkmstr wrote: Fiddling with dampers should be a temporary solution to the user not paying attention. Too much wood and a run-away pit - sure, slow the airflow down to regain control and learn from that. I routinely run both ends wide open controlling temps with fire size. Yes, you may have to add wood (smaller pieces) more often but your temp spikes are pretty much eliminated. +1. Exactly my experience, and my temps hover around 225F-250F with both vents open. I'm currently using a small fire basket to contain my fires, so I'm not letting my wood cover the entire surface of the fire grate. When I tried doing that when the pit was new all my coals would spread out and fall through the grate, which prevented me from building up a good coal base at all, let alone with wood splits only like I'm doing now. I’m in the same position as you guys and been following a discussion on another forum regarding what I would call super premium smokers, Jambo and outlaw. They both guarantee excellent drafting as well as insulated fireboxes, they seem to give the user the best chance of running pure log fires efficiently. I can’t help thinking anything less, ie the Yoder’s, horizon, old country pits etc are just supposed to be ran as hybrid charcoal and log smokers. The high end Pits are a once in a life time purchase and maybe worth looking into, they’re pricey but at least you’re getting the best with zero modifying. I will upload some pictures on their firebox intake vents and the firebox to cook chamber vent, it’s very nice. I'm still waiting to see how good Aaron Franklin's hand-made pits perform. They're supposed to be available this summer, but since his restaurant fire I imagine he might be a little behind schedule. I've never seen Aaron actually start his firewood so I don't know if he uses charcoal as a starter. I use a propane log starter and some people use weed burners these days. You don't really have to use charcoal at all if the pit will burn splits properly. My LSG came with the optional gas starter and I’ve got to tell you this thing is no joke. Put it on high and it sounds just like a weed burner, so I anticipate that I could get splits to turn to coals pretty quickly if needed. My brother in law owns a wood fired pizza joint and his almond splits are the perfect size for my smoker. I reached out to his wood supplier and he sells apple, almond, cherry, white oak and hickory. I’ll probably go with a bunch of oak for my base and use the fruit woods for flavor. Not trying to shift this thread too much but have any of you used almond wood? Some sites/forums say it’s a lot like pecan. slamkeys wrote: I've never seen Aaron actually start his firewood so I don't know if he uses charcoal as a starter. I use a propane log starter and some people use weed burners these days. You don't really have to use charcoal at all if the pit will burn splits properly. He is not using charcoal. I've seen him start his fires using only logs and a big piece of butcher paper. And according to the BBQ joint Holy Smoke in Sweden, whos got a real Franklin bit in their arsenal, thats how they start their fires as well! The first thing I noticed was the excellent pull that smoker has. The flames and smoke were being sucked into the cooker, not backing up and burping out of the fire door opening. Yeah, the benefits of a franklin built smoker i guess. Im sure Franklins backyard smokers will be as good as they come. But your answer got me thinking. Is the backdraft of smoke out the fire door a common problem with cylinder type offsets? Obviously not as major as with the wichita, but still? Ive noticed some videos of different smokers where this occurs. antinho wrote: Is the backdraft of smoke out the fire door a common problem with cylinder type offsets? If the pit is designed properly then the short answer is "NO" - not a common problem. Of course, this assumes you're speaking of during a cook. When an offset is cold (at start-up) you can get a little backflow until the draft is established by heat and a clean burning fire. I'll add that my old trailer pit had the double moon cutout for the firebox door - essentially one moon was higher than the fire grate. I never did get scorching of the firebox door as I've seen with the Wichita. Again, there's a critical balance between all aspects of a pit - firebox size, cook chamber size, exhaust stack size. Once you get there a pit can be pretty easy to operate. Thanks, that was my first thought aswell. txsmkmstr wrote: If the pit is designed properly then the short answer is "NO" - not a common problem. Of course, this assumes you're speaking of during a cook. When an offset is cold (at start-up) you can get a little backflow until the draft is established by heat and a clean burning fire. Wind is a big factor with my Wichita because it can reverse flow easily if the wind is blowing in the wrong direction. I frequently put a "hat" over my exhaust to help with wind problems, but others have said their smokers aren't really affected by wind. That big Franklin smoker in the video is chugging away and it looks like they were just getting it fired up. smoke_savage wrote: I’m in the same position as you guys and been following a discussion on another forum regarding what I would call super premium smokers, Jambo and outlaw. I don't know about the other brands you mention but my Horizon doesn't require charcoal, at all. I usually start out with one chimney full, just to help the initial wood splits ignite, and then start tossing splits for the duration of the cook.